During setup place the the beast near the center of the battlefield on clear terrain, at least 4" from any town. The beast is considered to have a speed value of 4". On his turn, any player may give the beast a move action. This does use up an action, but the beast does not get action tokens in the way warriors do, and may not be given more than one action each turn. The beast's movement is affected by terrain in the same way that warriors are. The beast is considered a figure, but not a warrior. The beast blocks lines of fire in the same manner that warriors do. If the beast is on the battlefield, you may gain a free action this turn to move the beast and attack an adjacent warrior controlled by an opponent, as if the beast were a warrior with the Charge special ability. Consider its speed value to be 6, its attack value to be 8, and its damage value to be 2. The beast loses this ability at the end of the turn. If you are using a regular deck of playing cards to substitute for the Conquest Deck, you can delegate one of the less important ones (such as "Nightfall") to represent "Beast Gone Wild". Draw a card from the Rare Cards Deck and follow its instructions. If you are using a regular deck of playing cards to substitute for the Conquest Deck, you can use the two jokers to represent this card. As for the Rare Cards Deck itself, you must construct it on your own. Labor-intensive, yes, but Rare cards can really make a game interesting! 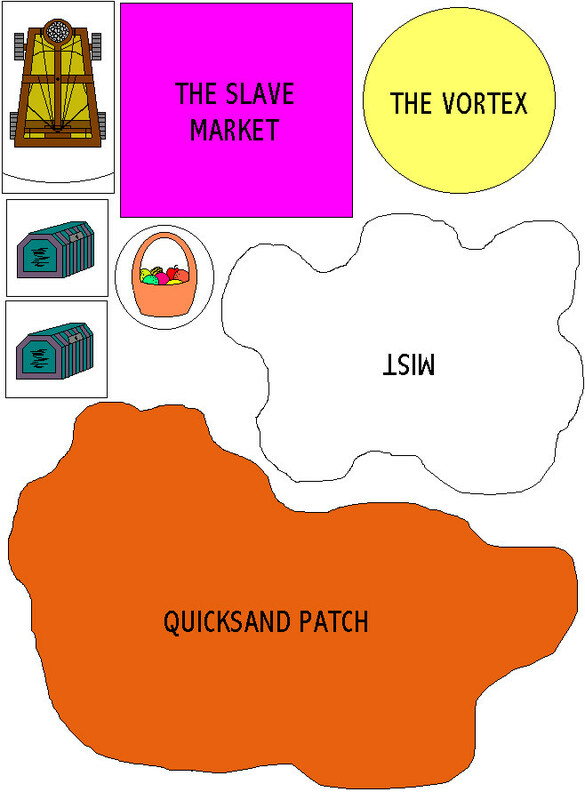 Some rare cards refer to new terrain and items created for this game. Keep these aside for when a rare card instructs a player to place one on the battlefield. The following file contains all of the new special terrain and items as well as the catapult (see below). You need only print one copy of this file. Quicksand Patch functions like shallow water with the following added characteristic: If any warrior begins a move with any part of its base touching Quicksand Patch, roll a die. On a 1, the warrior fails to move this turn, and takes one click of damage (defense special abilities are ignored). On a 2, the warrior fails to move this turn. On a 3-6, the warrior may move normally (with speed value cut in half unless it has the Flight special ability). Whether the warrior is successful in moving or not, it still gets an action token. All line of fire passing through Mist are considered blocked. If any figure's center dot passes over The Vortex, end that figure's movement and roll a die. On a 1, the figure is eliminated and removed from the game completely. On a 2-6, the played that caused that figure to be moved must place it on any clear terrain, but not in base contact with any other figure. At the beginning of his turn, a player may eliminate a captive held by a captor he controls and gain gold equal to the captive's point value as long as both the captor's and captive's center dots are on the Slave Market. Captives eliminated in this way are removed from the game completely. See the rare card titled "Fruit Picking". This is perhaps the most complicated of the advanced features, and the least necessary. Admittedly, my friends and I do not play with it often. However, it might be useful for shaking up highly defensive games. The catapult is a figure that may be purchased by any player during buy troops phase for 15 gold, and is placed directly outside a settlement occupied by that player, with an action token. (You may want to attach the cut-out catapult paper to the top of an eraser or some other item that has more weight to it) Note that the catapult's "center dot" is not in the exact center of the figure. The catapult is not considered a warrior but is generally treated like one. It may be given move or range combat actions. It gets action tokens like warriors. It may never be given an action if it already has an action token, and is never pushed. The catapult blocks the movement of figures, but hinders lines of fire. The catapult has a speed value of 6. Its movement is affected by terrain in the same way as warriors. However, it may never enter settlements, even partially. The catapult must break free from base contact by rolling a die like a warrior, but it does not get a free spin for this, nor does it get a free spin when an opposing warrior comes into contact with it. Opposing warriors do not need to roll to break away from the catapult. Though the catapult has no faction, it may be part of movement formations with any faction. The catapult may not be given close combat actions. It may be given range combat actions with its range value considered to be 10, and its attack value considered to be 10. For damage, roll one die and subtract 1 from it. (a negative result is 0) This is the number of clicks of damage delivered to the target. The catapult may be given a range combat action while an opposing warrior is in contact with it. When the catapult is given a range combat action, the line of fire is never considered blocked or hindered by terrain, castle walls, or figure bases. The catapult may not be part of range combat or close combat formations. The catapult does not take damage in the way warriors do. It is destroyed when an opposing warrior in base contact with it is given a close combat action to attack it. No dice are rolled for this attack; it is always successful. When this happens, return the catapult to the troops for hire. The catapult is unaffected by the range combat of opposing warriors. The catapult may not be captured.